10. Bacon doesn't throw fits in the store until it gets the toy it swears it was promised. 9. 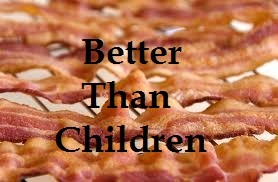 Children eat all the bacon, never once has bacon eaten all the children. 8. The cost of raising children has gone up thousands of dollars in the last decade. The cost of bacon, about a dollar. 7. Children want you to take them to the zoo and other such places. Bacon wants you to sit on the couch with a plate of itself. 5. When children age, they can become bitter. When bacon is aged it becomes even more delicious. 4. Children are our future. Bacon is all about living in the moment. 3. You'll never hear me say, "I don't like other people's bacon." 2. If a child is bad, you have to correct it and teach it until it knows better. If a bacon is bad, you throw it out and go get more bacon. Not that bacon would ever be allowed to go bad. 1. Children make you get up in the morning. Bacon gives you a reason to. *Clinical studies are still ongoing. TS, I believe this is the very best and the very funniest post you've ever done! And I have "raised" both bacon AND children, so I do consider myself an expert. Bacon does give you a reason to! Perfect. This post is the reason you remain one of my favorites. It's so random and hilarious. PS There's a bacon flavored chocolate bar that's divine. Is there a child flavored --never mind, that's really gross. Hilarious! You almost have me convinced to trade my kids in for bacon! Super funny! I'm sharing this with my sibs. LOL Funny list! Now if you can make children out of bacon you could have something there. Bacon ate my pet turtle once but never a child. Also, jumbo shrimp tastes great wrapped with bacon not children.